Sustainable Surf and Pure Strategies have recently completed a lifecycle study of a more sustainable surfboard. 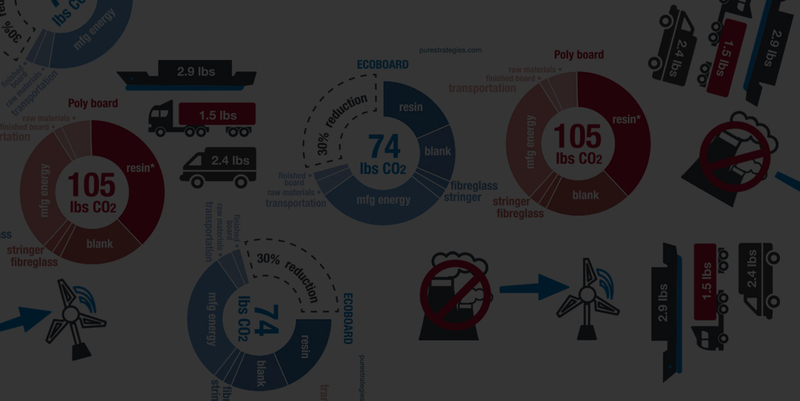 This compares the carbon footprint of a standard “poly” surfboard (PE resin/PU blank)* vs. an ECOBOARD made with bio-based epoxy resin and recycled content EPS blank. Lifecycle results of the carbon footprint of two surfboards. The environmental footprint of a surfboard depends on the “lifecycle” of each component, from raw materials extraction and refining, to manufacturing energy use, and transportation of the finished product to stores. A complete data set was provided by surf industry partners Channel Islands and Firewire Surfboards. This was analyzed by Pure Strategies to measure the carbon footprint of shaping, laminating, sanding, transportation, and each material used to make a surfboard. The lifecycle results show a 30% reduction in the carbon footprint of an ECOBOARD using Entropy Super Sap bio-epoxy resin and a Marko Foam EPS blank with 25% recycled content. The results also show a significant reduction in carcinogenic chemicals emitted during the glassing phase when using epoxy-based resins. A standard polyester board weighing 5.75 lb produces an additional 10 lbs of waste material – nearly double the weight of the board. A 5.5 lb ECOBOARD generates 5.9 lbs of waste material – which is still more material than the finished board itself. The study also reveals that this wasted resin and foam is a large factor in the total carbon footprint – 40% for a “poly” board and 22% for an ECOBOARD. Renewable can reduce the carbon footprint of surfboard production. Another interesting finding is that more than 30 lbs of the carbon footprint of any board is a result of the energy used in the board manufacturing process. By reducing energy inputs and shifting to renewable energy (either by installing solar panels or purchasing green power), both poly and ECOBOARD manufacturers can dramatically cut their CO2 emissions from going into the ocean. Comparison of transportation options for surfboards to retail. In most cases, transportation of finished surfboards from the manufacturer (Poly or ECOBOARD) accounts for between ~2 and 5lbs of CO2. For example, shipping from Asia to California and/or trucking from the West Coast to the East Coast – getting your board from your shaper to your favorite surf shop is a relatively small part of the board’s total carbon footprint. With this in mind, the biggest environmental gains for any type of surfboard will be made by choosing more sustainable materials, minimizing waste from manufacturing and reducing fossil fuel energy use in production. * Note, the footprint of the poly surfboard is calculated using the average of two data sets for polyester resin.